The number one site for free online clarinet lessons. Congratulations! It's quite industrious of you to look up more information on the clarinet. First of all, do you have a private teacher? Remember, a live, human teacher is your best bet in learning the clarinet well. These free online clarinet lessons are designed to discuss the most common problems I find across my private students, in clinics and are hurdles I've jumped over during my career. Print them out, find a mirror and watch as you tackle these online challenges. Now, go get your Clarinet, Now! The chin is often the worst culprit of clarinet playing problems. Does your chin move when you play? Here, you will note the basic description of the embouchure and read about the common problems and fixes. Do you bunch your lips up? Are you biting with enough pressure? When you play a musical line, do you move the embouchure around upon every different note? What about crossing the break, do you tighten up when you ascend and open up when you descend? If you think over these questions and wonder, I don't know if I'm doing any of these. Great! Come find out how it's done, correctly. Read here about the correct clarinet embouchure. It's difficult to write out instructions of the correct clarinet embouchure without also telling you what NOT to do. So, visit the Clarinet-Now.com Poor Clarinet Embouchure page to read about at least fourteen different types of poor clarinet embouchure. Are you taking in enough air to support a great clarinet sound? Do you know how much air to take? What do you know about the BB or BIG BREATH? Better air can improve your articulation and help your musicianship. Go to Free Clarinet Lesson #2 - Air Support. In this lesson, you will learn the basics of clarinet articulation. Where the tongue should touch the reed? How lightly should the tongue work? What are the differences between legato and staccato? What are the differences between amateur and professional clarinet articulation? On this clarinet articulation lesson, you will read seven steps to creating the beginning of a clarinet sound. Yes, a clarinet sound! Not, POW! then sound; or Flick! then sound; just the start of a good clarinet sound. Then, you’ll read on how to return the tongue to the reed for a quality re-articulation. Also, the biggest put-down of all time: Are you a “Chin-chewing clarinet articulator?” Well, that’s not too bad. But, many people do this. They chew their chin while they tongue. It is time to go find your mirror to test your chin out. Best of luck to you. Now, go get it. Go get that Clarinet, Now! and go to Free Online Lesson #3 about Clarinet Articulation. Developing a fast, liquid, smooth left-hand technique will work best if your fingers are very efficient. Note the wording “left-hand fingers” not left hand wrist. Kal Opperman says, “Playing the clarinet is from the knuckles down.” If your left wrist rotates, you do not have ultimate efficiency in your fingers. 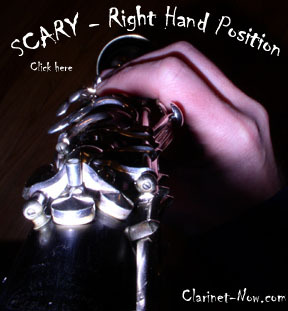 Click here for Free Clarinet Lesson #4 about Clarinet Left Hand Position. What is the natural curvature of the right hand? Where should you place the thumb rest on the thumb? Are you using the pads or tips of your fingers? What is home base for your right pinky finger? Go to the Clarinet Right-Hand Position Lesson #5 page. Learn the ten basic tips to improve your sight-reading on clarinet. Also find links to Sight-Reading Crunch-time, Pushing Your Limits, Finding Music to Sight-Read and the Sight-Reading Ultimate Goal. Go to the Clarinet-Now.com Sight-Reading page Lesson #6. Crossing the break – On clarinet, going from the chalumeau or throat tone registers up to the clarion register by operating the “register” or “speaker” key with the left thumb. The “break” is a nickname to an interval that is commonly “broken” on clarinet. If you wonder how an interval is broken, think of it as "not smooth" or a gap in the sound. In order to play the clarinet smoothly across the break, check out this Free Online Lesson and learn What is supposed to happen, what commonly happens and what your body is telling you if your break is in fact a break in sound. Go here from Free Online Clarinet Lessons to learn about real in-person Clarinet Lessons.